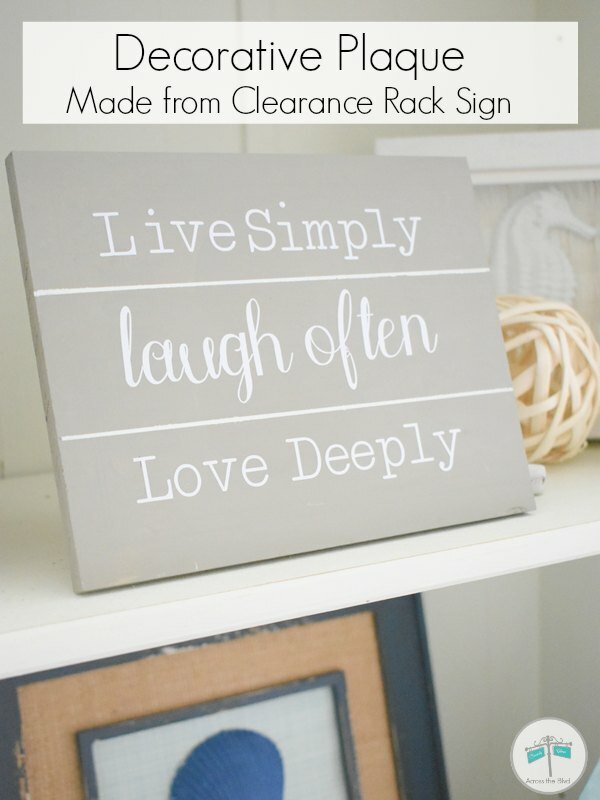 Making a live laugh love vinyl on wood sign was an inexpensive makeover of a clearance rack sign. Paint and vinyl letters were all it took to have the sign fitting in with my decor. For this month’s challenge, I sorted through a bin full of of thrift store plaques and clearance rack signs that I’ve purchased over the last year. It’s hard to pass up these items when they are priced so low and just need a quick makeover. I spent more time deciding on what quote I would use than it took to give the sign its makeover. 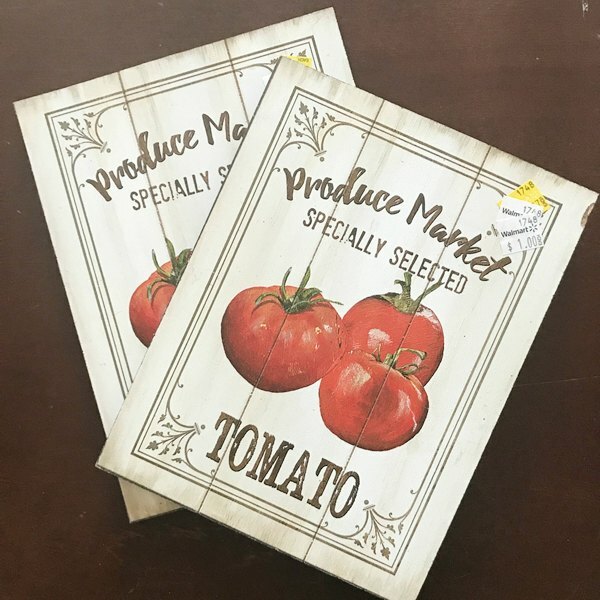 I found two of these wood signs in the clearance aisle at Walmart some time last year. They had three price stickers on them and the last one had them marked down to $1.00 each. They were cute enough signs, but they didn’t fit in with my decor. 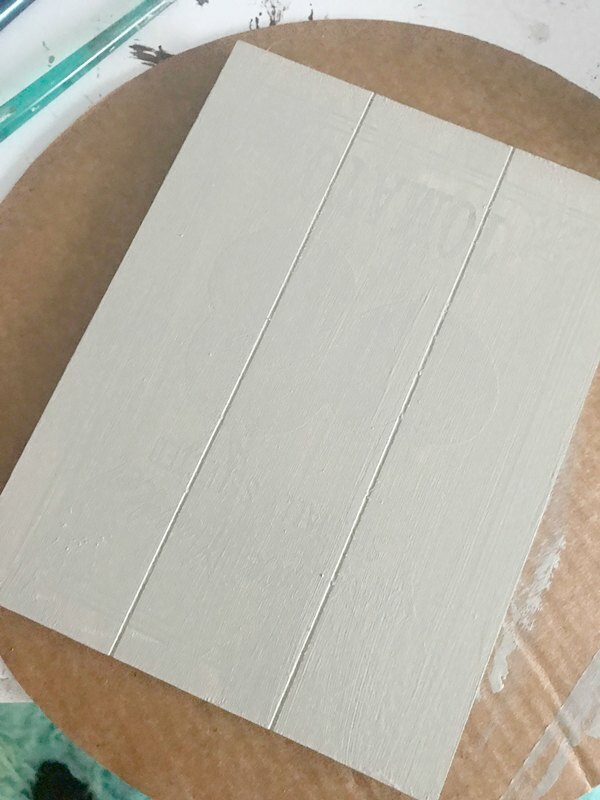 After one coat of Folk Art Home Decor Chalk Paint in Castle, the print on the sign was still showing through. A second coat covered it well and once it was dry, I added strips of Frog Tape, leaving the grooves in the wood uncovered. 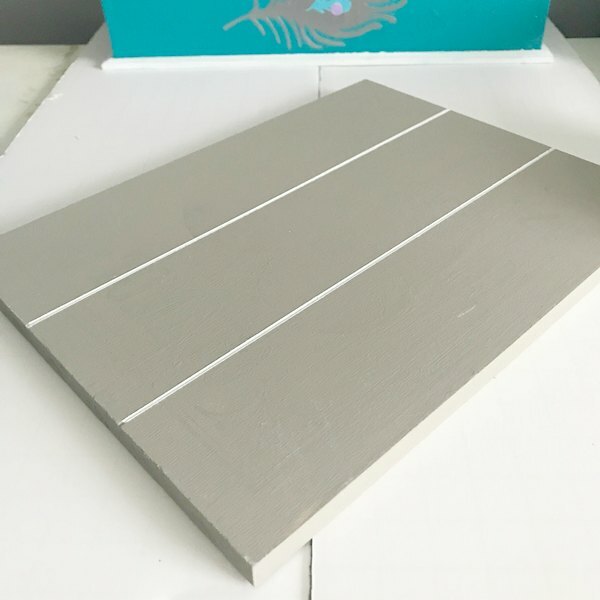 I used Home Decor Chalk Paint in White to paint the grooves. 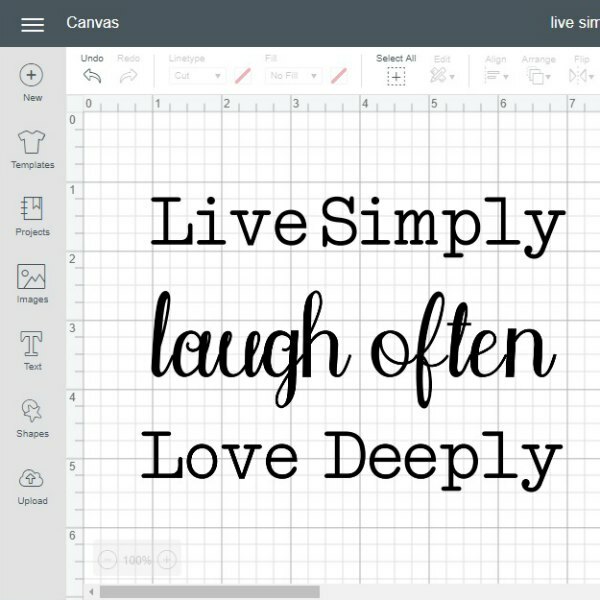 Using Design Space for my Cricut, I created the words for the plaque. 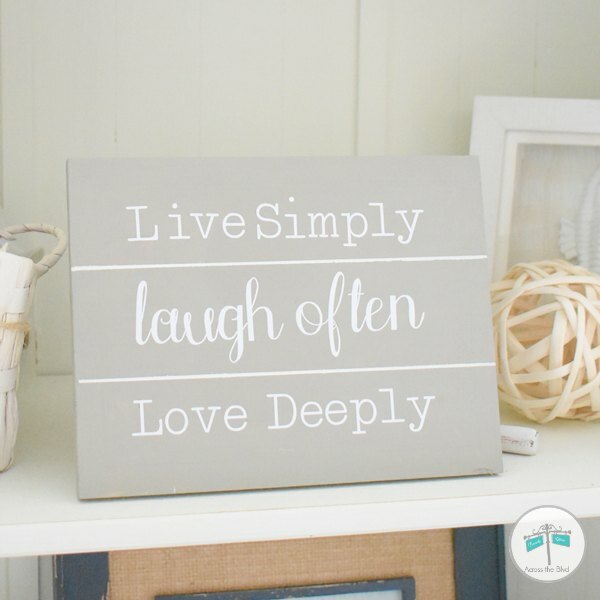 Live Simply and Love Deeply are in Typewriter Std Regular Font and Laugh Often is in Elizabeth font. After cutting the words and weeding them, I added each line to one of the areas of the plaque. I have lots of white vinyl in my craft stash, so this was another way to help de-stash. I have the plaque displayed on a bookcase that got a makeover a few years ago that’s in one of our guest bedrooms. 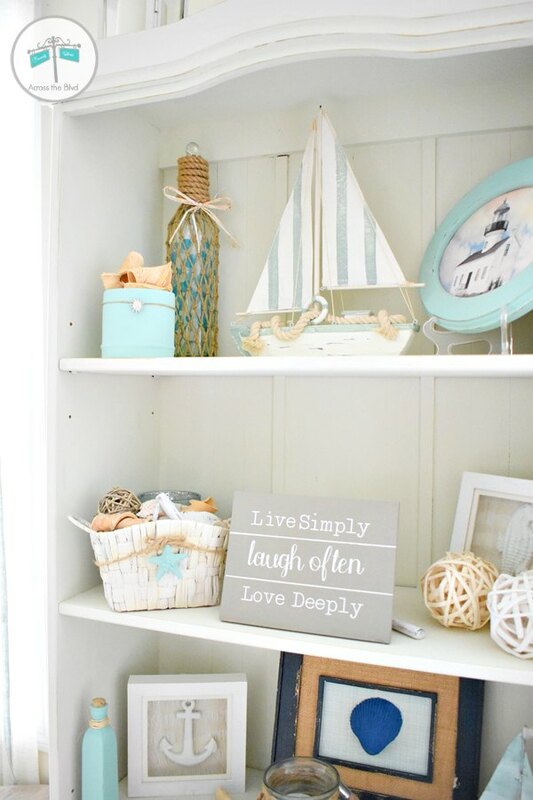 It fits in well with the coastal decor on the shelf. The plaque is made to hang on the wall, but I used a small picture stand behind it to keep it upright. 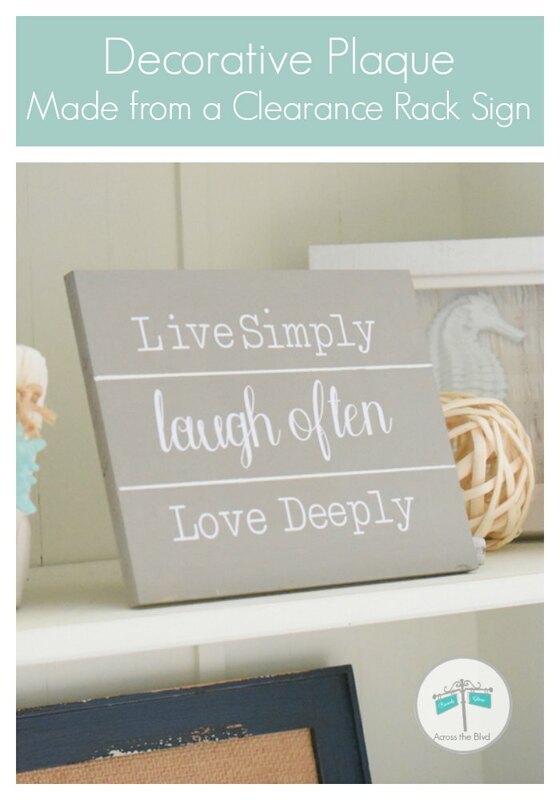 The second of the two plaques is getting a makeover for summer, but I haven’t decided on the quote yet. 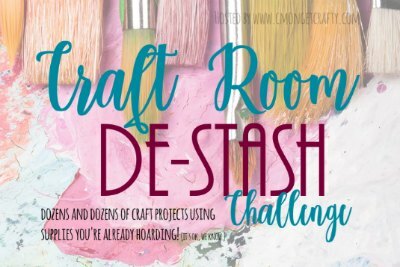 Does your craft room need a bit of de-stashing? Check out the projects below for ideas! Good job! I never thought of buying signs on clearance. I love finding clearance rack items that just need a bit of a makeover. Thanks, Kristie. You completely transformed the Walmart sign into a masterpiece, Beverly! Looks awesome! Thanks so much, Gail. It was a fun way to use up some items in my stash. Thank you for adding the names of the fonts you’ve used. I always have such a hard time deciding on a font or a pair for a project. Love those grooves in the wooden signs. Your beachy theme is right down my alley. Pinning! I always wonder about font names in projects I see, so I wanted to make sure to include them. 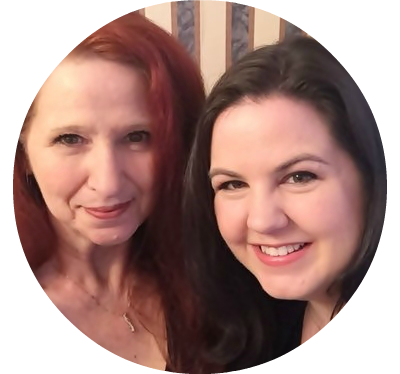 Thank you, Habiba and thanks so much for pinning! Your sign looks great! I love looking through the clearance stuff at walmart – especially when you can find great bargains like your sign! Thanks, Roseann. I love looking through the clearance rack, too. I love how you used clearance signs. Smart! Does the vinyl stick on its own? I have a Silhouette Cameo that i need to learn how to use. Thanks, Lauren. I love finding bargains that just need a little makeover to fit my decor. Yes, the vinyl sticks on its on. 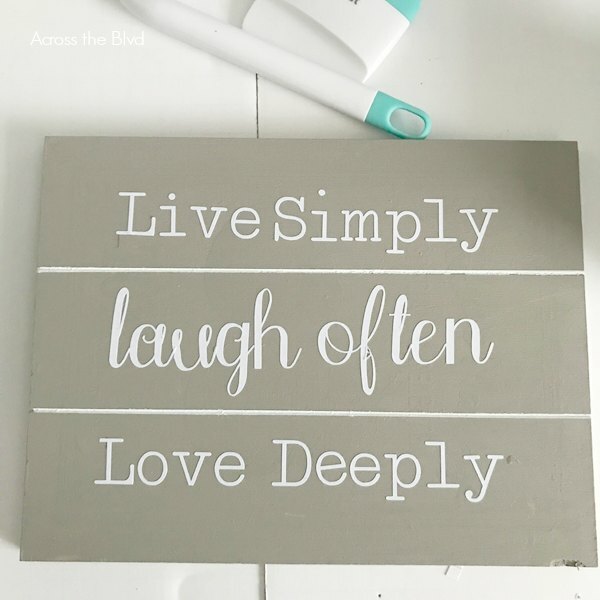 I’m still learning about my Cricut, but I love making decor items with it. Thanks! I like that font a lot, too. Thanks for the fonts as I am always wondering where or what they are. I love your shel unit with that wonderful sign. 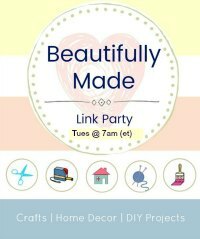 Thanks for joining our link party at Celebrate your Story Link Party. I often wonder about fonts I see in projects, too, so I try to make sure to include them in mine. Thank you, Kari! Definitely a great project to reuse what you have. I like how it turned out. I agree. I love using items I have on hand for projects like this. 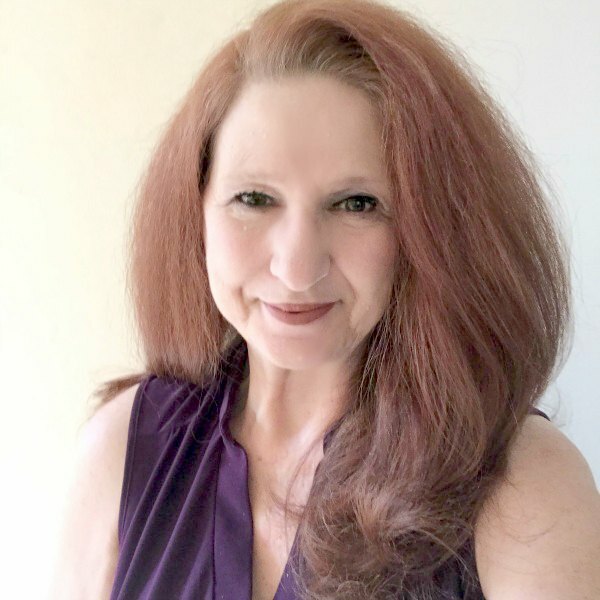 Thank you, Donna. Thank you, Marci. I love when a simple project like this turns out how I envisioned it. Total score! I’m always grabbing things like that when I see them, there is always something that can be made from a sign that just doesn’t work with your decor! Thanks, Emily. I love finding items like this that just a little makeover.